Home / Books / Who Owns the Sky? Global warming has finally made clear the true costs of using our atmosphere as a giant sponge to soak up unwanted by-products of industrial activity. As nations, businesses, and citizens seek workable yet fair solutions for reducing carbon emissions, the question of who should pay -- and how -- looms large. Yet the surprising truth is that a system for protecting the atmosphere could be devised that would yield cash benefits to us all. 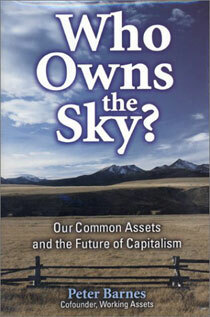 In Who Owns the Sky?, visionary entrepreneur Peter Barnes redefines the debate about the costs and benefits of addressing climate change. He proposes a market-based institution called a Sky Trust that would set limits on carbon emissions and pay dividends to all of us, who collectively own the atmosphere as a commons. The Trust would be funded by requiring polluters to pay for the right to emit carbon dioxide, and managed by a non-governmental agency. Dividends would be paid annually, in much the same way that residents of Alaska today receive cash benefits from oil companies that drill in their state. Employing the same spirit of innovation that brought millions of dollars to the nonprofit sector through his company Working Assets, Barnes sets forth a practical new approach to protecting our shared inheritance -- not only the atmosphere, but water, forests, and other life-sustaining and economically valuable common resources. He shows how we can use markets and property rights to preserve and share the vast wealth around us, allowing us not only to profit from it, but to pass it on, undiminished, to future generations. Who Owns the Sky? is a remarkable look at the future of our economy, one in which we can retain capitalism's virtues while mitigating its vices. Peter Barnes draws on his personal experience as a successful entrepreneur to offer viable solutions to some of our most pressing environmental and social concerns. Chapter 2. The Sky Is Filling! Chapter 4. Who Owns the Sky?